Did a new Motorola smartphone just leak? Photos have appeared online of an alleged fourth generation Moto X handset that’s reportedly due in 2016. Smartphone leaker and blogger Steve Hemmerstoffer (@OnLeaks) posted photos of the mysterious Motorola smartphone early Wednesday on French tech site NWE. According to the NWE post, the photos are of a unreleased Moto X that’s speculated to be called the “Moto X4” or “Moto X 2016.” This is the first major leak and rumor of a fourth generation Moto X. Are we seeing the new Moto X? 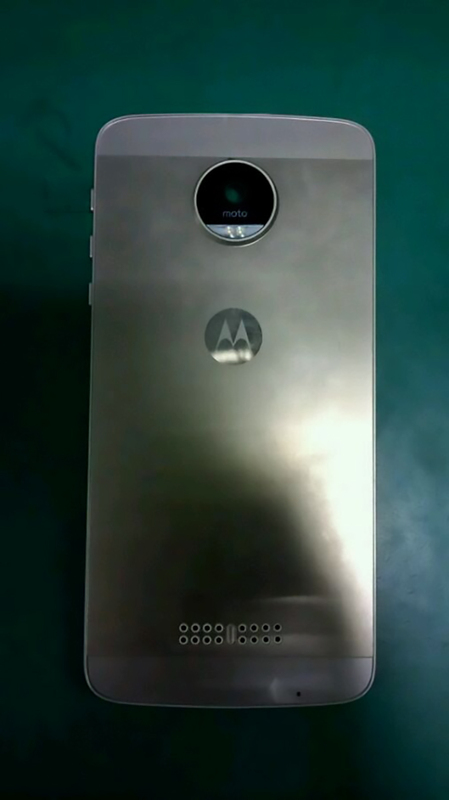 The photo only shows the back of the smartphone: a Motorola emblem on a metallic gold finish accented by grey plastic edges. It seems the company is going for a metal-clad unibody design in 2016. The upper center of the alleged fourth generation Moto X features a large black circular camera lens inscribed with “moto” in lowercase. The lens and sensor on the smartphone are conspicuously large, hinting the handset may sport an advanced camera. The smartphone also has three buttons on the upper right side of the device, right in thumbs reach. You can also see the mic and speakers on the lower half of the smartphone. It’s important to note that we could be looking at a completely fake phone. Or a Motorola prototype that will never make it to mass production. If the leaked smartphone is real, expect to see a release date announcement sometime in mid-2016.